Community Conversations are guided discussions held with parents and community members who want to share their perspectives on our schools and learn about current education topics. Data is compiled anonymously and used to guide future action. Program available for any group interested in public education, including businesses, schools, churches, and civic groups. Would you like to attend or host a Community Conversation? Contact us through our connect page. Click here to read the Executive Summary of the 2017-18 Community Conversations Report. The Parent Engagement Program (PEP) is a parent leadership class designed to increase positive parent engagement and enhance school-parent collaboration. PEP classes are conducted by nationally trained facilitators and cover topics such as school curriculum, data, testing and leadership. The next PEP class will commence in the fall of 2018. The Parent Engagement Program (PEP) Academy is a yearlong series of public education related workshops, each approximately two hours in length, offered during lunch and evening hours. The topics for PEP Academy depend on current educational issues and community interest, but may include workshops such as college and career readiness, digital learning, and kindergarten preparation and readiness. PEP Academy will be held during the 2017-2018 school year. 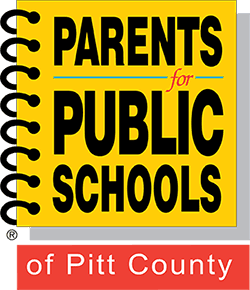 School tours are offered at any PCS school to help recruit families to Pitt County and to the public schools, as well as give community members a chance to see what’s new in the public school system. Contact us through our connect page to schedule a tour today!